Context: Newly started government sponsored pharmacies providing discounts have been available to the public at the medical college hospitals in West Bengal. Aims: The present study was undertaken to evaluate the drug prescribing trends from the prescriptions at such a pharmacy at a tertiary care hospital. Methods: The study was a prospective cross-sectional study that spanned for a period of 1-month from 1 to 31 August 2015. Prescriptions were reviewed and analyzed using the World Health Organization indicators for drug utilization studies. Statistical Analysis: Tools of descriptive statistics were used to analyze the collected data. Results: During the study period, a total of 3300 prescriptions were recorded and analyzed with a total number of drugs prescribed being 10,560. The average number of drugs per prescription was 3.2. Only 3.83% of the prescriptions contained injections which were due to the fact that the prescriptions were mostly from outpatient departments and on discharge. 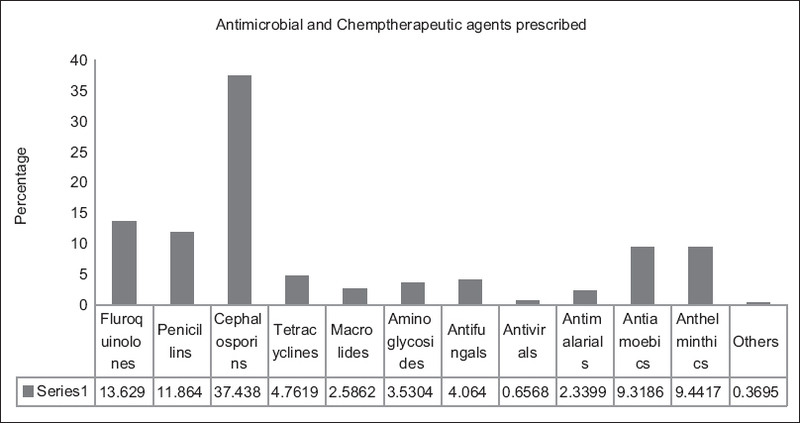 It was noted that 79.19% of the drugs were prescribed in generics and 23.06% of the drugs prescribed were antimicrobials. Irrational usage of vitamins, nutritional supplements, etc., was not noted. Conclusions: This study provided a picture of pattern of drug usage and prescription at a government sponsored subsidized pharmacy in rural West Bengal. Nearly a quarter of all prescriptions contained antimicrobials and a high proportion of prescriptions were made in generic names. Need was felt of a hospital antibiotic policy and prescriptions in accordance. Further, long-term studies are warranted. Background and Aim: Perioperative shivering during subarachnoid anesthesia is a common complication in patients undergoing urological procedures. It is secondary to peripheral vasodilatation from sympathetic blockade and/or cold irrigating fluids. Previous studies mainly emphasized on treating shivering rather than preventing it. Therefore, our aim was to evaluate the prophylactic efficacy of the oral formulation of clonidine for prevention of perioperative shivering in patients undergoing urological procedures under subarachnoid anesthesia and also to evaluate any side effects associated with it. Materials and Methods: A total of 60 patients scheduled for elective urological surgeries under subarachnoid blockade were enrolled into this prospective, randomized, double-blind controlled study. Patients were randomly assigned to two groups. Group C (n = 30) received oral clonidine 0.1 mg tablets, whereas Group P (n = 30) received folic acid 5 mg (placebo) tablets 90 min before surgery. Subarachnoid blockade was administered with heavy bupivacaine (0.5%), 3 ml (15 mg). All procedures were performed in the similar operation theater conditions. Hemodynamic parameters, axillary temperature, and shivering were recorded. Any side effects were recorded and treated appropriately. P <0.05 was considered statistically significant. Results: Incidence of shivering was significantly less in Group C (10%) when compared with that of the Group P (40%) (P < 0.01). Patients in Group C had Grade 1 or 2 shivering while in the Group P patients experienced various grades of shivering ranging from Grades 1 to 4. Conclusion: Incidence and severity of perioperative shivering was significantly less (P < 0.05) in clonidine group without significant side effects. Background: Pictorial warnings are effective in promoting smoking cessation as shown by researches in the developed countries. The Government of India has also introduced pictorial warnings as one of the strategies among different tobacco control strategies. Objective: The objective of this study was to find the awareness of pictorial warnings present on cigarette packets and its impact on smoking cessation among cigarette smokers in Shimla, Himachal Pradesh. Materials and Methods: The study was conducted among 200 patients attending the outpatient department in the Department of Oral Medicine and Diagnosis from May 1, 2010 to August 31, 2010. Structured questionnaire consisted of demographic details, health-related issues of smoking, awareness about pictorial warning, and impact to quit smoking. Results: Among the study patients, maximum number of patients who were using any form of tobacco products were 35-44-year-old, and higher consumption was seen among the people from lower socioeconomic status. Younger age group, i.e., ≤25 years, those with higher socioeconomic status, urban residence, and literate were more aware about pictorial warning on cigarette packs and majority of them were about to quit smoking. Conclusion: Pictorial warning is an effective method to improve the awareness among smokers on the deleterious effects of smoking. The present study has shown significant results as the youngsters are less involved in the habit of smoking, aware about pictorial warning on the cigarette pack depicts, and motivated to quit smoking after knowing the harmful effects which the warning on packs reveals. Background: Some medical devices are reused after treatment with disinfectants at manufacturer's recommended concentrations (RCs), based on experimental evaluation studies of their bactericidal, sporicidal, and mycobactericidal concentrations. However, this may not be sufficient to eliminate all colonized highly drug-resistant biofilms on medical devices, resulting possibility in iatrogenic infections by recolonization of highly resistant persisters. The objective of this study is to evaluate the antibacterial efficacy of different concentrations of novel and conventional disinfectants on in vitro grown biofilm of multidrug-resistant nosocomial bacterial isolates and a reference strain. Materials and Methods: Multidrug-resistant and strong biofilm producers Pseudomonas aeruginosa (n = 4) and Escherichia coli (n = 5) nosocomial isolates and one reference strain, P. aeruginosa PAO-1, were selected after testing their biofilm status by modified Christensen's method and Stepanovic's interpretative criteria. The activity of three different groups of new disinfectants, Novacide, Virkon, Silvicide and two conventional disinfectants, phenol and glutaraldehyde, were assessed on their in vitro grown biofilms as percentage of total surviving bacteria within biofilm matrix after challenge at different concentrations in terms of multiples of RC and different contact time. Results: Modified RCs for Virkon, phenol, and Silvicide, as pointed out by in vitro study, were 4, 8, and 10 times higher than the one suggested by the manufacturer. Novacide was least effective, whereas glutaraldehyde at its available concentration was also not effective in removal of biofilm bioburden. Conclusions: RC was not sufficient to eliminate the in vitro biofilms tested in this study. Further studies using medical devices materials should be performed for clarification. However, this study points out possible relevant limitations of currently used hospital disinfectants and concentrations against biofilms. Additional measures to prevent reinfections related to their use of medical devices are mandatory, and this study suggests that optimization of disinfectants concentrations may be highly relevant. Background: Since its inception, the subarachnoid block has remained the technique of choice for lower limb surgeries. However, nowadays, day surgery units are becoming popular which require anesthesia to be rapid, selective, and reversible with minimal hemodynamic alterations. 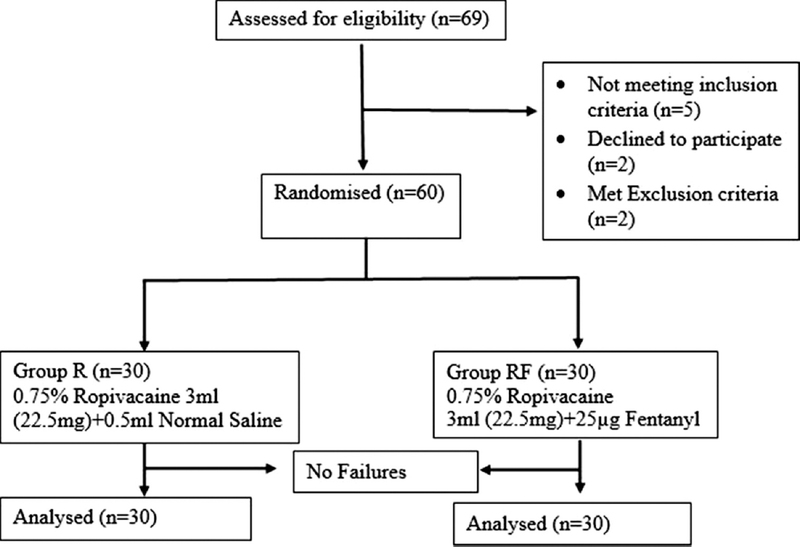 Ropivacaine with its profile ideal for these types of surgeries is hereby compared with and without fentanyl as an adjuvant in patients undergoing spinal anesthesia for lower limb orthopedic surgery. Materials and Methods: A total of 60 American Society of Anesthesiologists Grade I/II patients posted for elective lower limb orthopedic surgeries were randomly given either 3 ml of 0.75% plain ropivacaine (22.5 mg) + 0.5 ml normal saline or 3 ml of 0.75% plain ropivacaine (22.5 mg) + 0.5 ml fentanyl (25 μg). The sensory and motor block characteristics, hemodynamic changes as well as any adverse effects were recorded. Results: Demographic data were similar between both groups. Onset to T 10 was faster (5.76 ± 1.4) in Group RF compared to R (7.47 ± 2.14; P < 0.001). The median (range) maximum height in Group RF was T 2 (C 7 -T 4 ) while in Group R was T 4 (T 1 -T 6 ). Time to reach maximum height was shorter in Group RF. 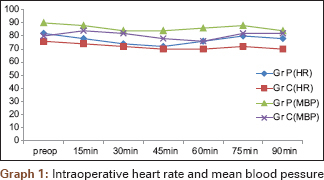 The onset of motor block was faster (8.43 ± 1.80 min) in Group RF compared to Group R (12.27 ± 1.78; P < 0.001). Time to regression of sensory block to L 1 was longer in the Group RF than Group R (245.66 ± 22.35 min vs. 187.16 ± 17.053 min; P < 0.001). Group RF (289.33 ± 23.11) produced significantly longer duration of motor block compared to Group R (232.33 ± 18.65; P < 0.001). Duration of analgesia was significantly longer in Group RF than Group R (P < 0.001). Conclusion: Both groups achieved adequate anesthesia and analgesia, however, ropivacaine with fentanyl produced a more rapid and prolonged sensory and motor blockade with minimal hemodynamic changes. Background: India has a highest global burden of cervical cancer. Infection with a high-risk human papillomavirus (HPV) genotype has been identified as the most important etiologic risk factor for the development of cervical cancer. Aim: The aim of the study was to detect the genotype of high-risk HPV-de-oxy-ribose nucleic acid (DNA) in a patient suspected of cervical cancer and to study the epidemiological factors related to cervical cancer patients. Materials and Methods: The present prospective study was carried out from January 2013 to December 2013 in the molecular medicine laboratory located in our tertiary care super-specialty hospital. Fifty-two female patients who presented in the Gynecology and Oncology Outpatient Department with vaginal bleeding were included in the study. 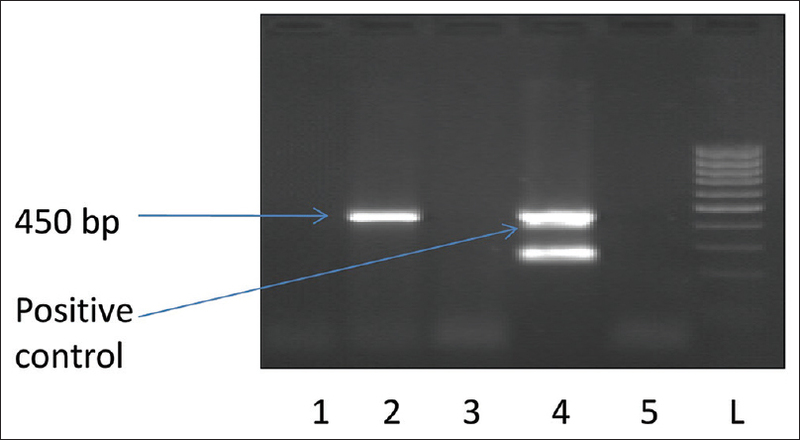 Followed by the detection of HPV genotype using specific markers, restriction fragment length polymorphism was done using different digestion enzymes. Results: Of the 52 cervical samples subjected to polymerase chain reaction for the detection of high-risk HPV-DNA, 44 (84.6%) samples tested positive, and 8 (15.3%) samples lacked the HPV-DNA. The overall distribution of the major HPV types was as follows: HPV16 (50%) was the most prevalent genotype, followed by HPV18 (15.3%). Other genotypes included 1.9% HPV33 and 1.9% HPV62 while infection with the mixed type (HPV16 and HPV18) was seen in 15.3% of patients. Conclusion: As we switch from cytology-based screening to HPV-based screening, genotyping could potentially provide information on individual risk stratification, therapeutic decisions, epidemiological studies, and vaccine development. Background: Methicillin-resistant Staphylococcus aureus (MRSA) is one of the most common hospital-acquired infections associated with a significant morbidity and mortality. Healthcare workers (HCWs) act as carriers for MRSA and transmit the organism across individuals. Hence, we undertook this study to assess the prevalence of MRSA among HCWs in a tertiary care hospital and their hand washing hygienic practices. Materials and Methods: A cross-sectional study between March and November 2014 was conducted. Dry swabs were taken from the nasal mucosal membrane, both the palms, web space between the fingers from each of the participants and were subsequently cultured on mannitol salt agar and antibiotic susceptibility to methicillin was assessed using Kirby-Bauer disc diffusion method using cefoxitin. In addition, information on demographics, occupation, and use of antiseptics were collected from the study participants. Results: A total of 17/150 (11.3%) were found to be MRSA positive of which 10 were staff nurses, three each were laboratory technicians and class IV employees and one was a doctor. Of the 17, 11 (64.7%) had shown growth from nasal swabs, 5 (29.4%) from digital and 1 (5.9%) in both the regions. Of them, 8/15 (53.3%) reported the use of only soap for hand washing whereas 7/15 (46.7%) were using soap and hand sanitizers and the remaining two not responded to this question. Only 9/15 (60%) frequently washed their hands, and the rest rarely did. Conclusion: More awareness and training sessions on the importance of MRSA and hand hygienic measures to contain the carrier status of MRSA among hospital care workers is warranted. Multidrug resistant tuberculosis is defined as resistance to at least isoniazid and rifampicin. Multidrug resistant Tuberculosis is one of the most challenging health problem being faced by the medical fraternity. An urgent need for newer and more effective drugs is relies to combat this Drug Resistant Tuberculosis menance. Bedaquiline, first in a new class of drug , has been approved by the US Food and Drug Association, the first time in 40 years that a drug has been approved that attacked Tuberculosis. In phase III trials Bedaquiline was found to bring about faster culture conversion and significantly more culture conversions. Accordingly, the FDA has approved bedaquiline as part of combination therapy to treat adults with MDR pulmonary TB when other alternatives are not available. Bedaquiline has a promising potential and has a favourable outcome in Drug Resistant Tuberculosis. Humans and pigs become the intermediate hosts by ingestion of the eggs excreted in feces by human Taenia solium carriers. Neurocysticercosis is the most common parasitic infection of the brain. A gravid segment of the parasite contains about 40,000 eggs and approximately 50 million people suffer world over with 50,000 annual deaths. Disease modifying treatment options have to be carefully chosen in the selected cases. We report a 14-year-old female child who presented with headache, fever, and blindness of 4 months duration she had bilateral papilledema with no perception of light. Investigations showed the whole brain parenchyma filled with cysts of the trophozoite stage sparing the pons, medulla, and spinal cord. Whole body was filled with sheets of cysticercal lesions in the skin, muscles, eyes, liver, and kidney. Patient was treated with steroids and anti-edema measures. Patient made very good recovery with very mild cognitive and behavioral sequelae. Sweet's syndrome (SS) (acute neutrophilic dermatosis) has already been described in cases of acute leukemia. It has been rarely reported in patients receiving bortezomib therapy for multiple myeloma (MM). A 65-year-old male, who was diagnosed as a case of MM 3 years back, initially received lenalidomide- and dexamethasone-based regimen, followed by lenalidomide maintenance, but subsequently had progressive disease with increasing monoclonal M-spike on serum protein electrophoresis, so shifted to bortezomib and dexamethasone along with monthly zoledronic acid-based treatment. He developed itching over face and neck with darkening and thickening of the skin. Examination revealed hyperpigmentation of face along with excoriation and erosions with involvement of "V" of neck with relative sparing of upper eyelid, postauricular area, and nasolabial folds. Histopathological examination of skin biopsy revealed neutrophilic infiltration of dermis suggestive of SS. 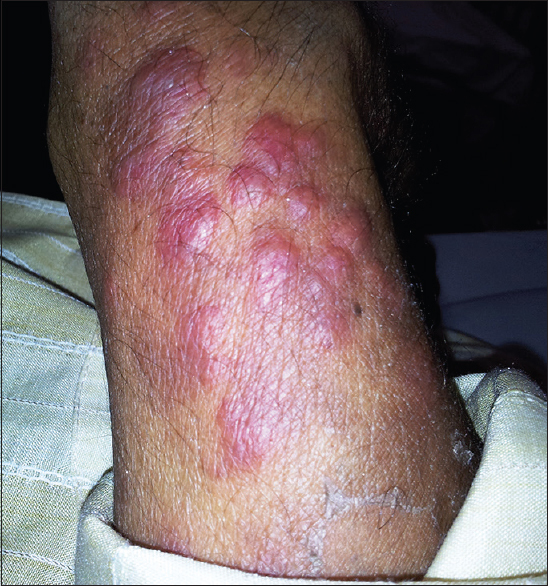 A wide variety of cutaneous complications has been described in 10-20% of patients receiving bortezomib. However, SS has rarely been described in such patients with only a few case reports reported so far. 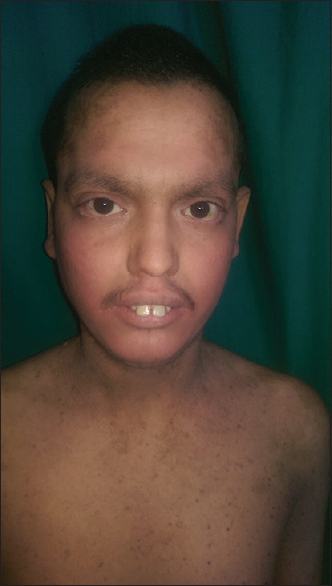 Our patient developed features of SS while on bortezomib therapy and had shown dramatic response to bortezomib withdrawal and treatment with oral and topical steroids showing temporal association of this rare syndrome with bortezomib therapy. 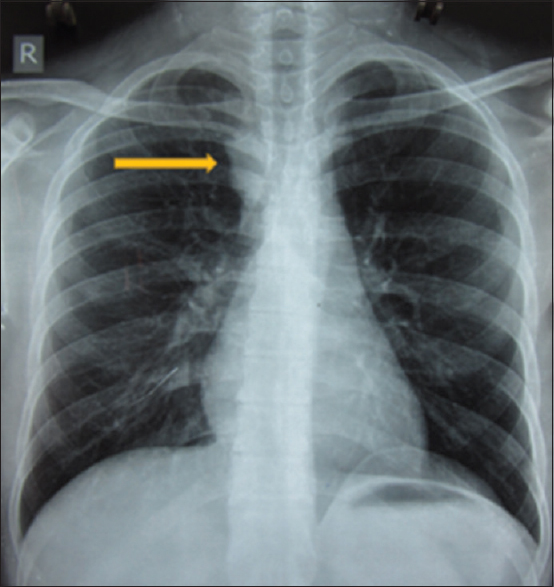 Paradoxical reactions (PRs) in patients of tuberculosis on antitubercular treatment (ATT) are a well-known entity, but pericardial effusion as a PR to ATT is almost an unheard phenomenon. Here, we report a rare case of pericardial effusion developing after the initiation of ATT in an immunocompetent patient, which resolved after the addition of steroids to his treatment. Intraventricular tumors are rare masses that are found less commonly in the pediatric population. 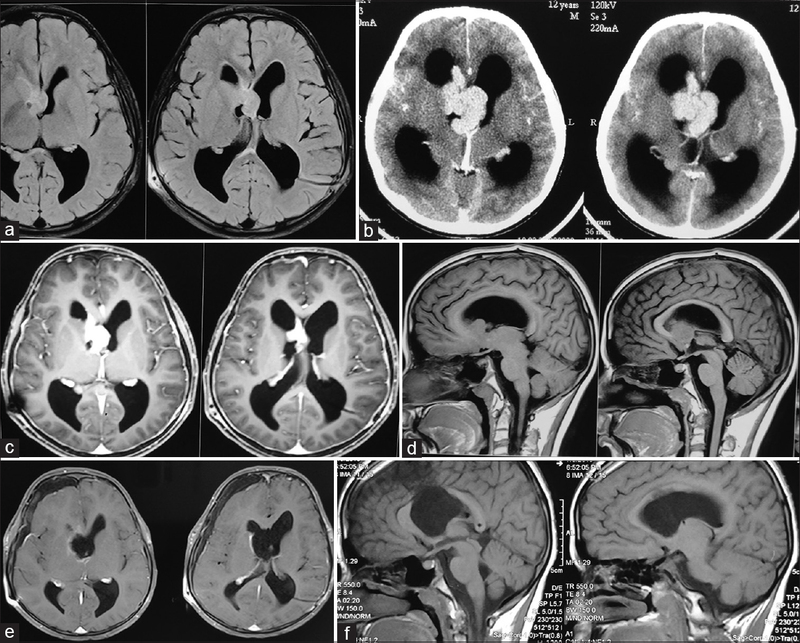 These tumors occupy a nonfunctional space and are often able to grow into a considerable size before clinical manifestations; these masses are treated surgically but pose a significant challenge to neurosurgeons. Primary central nervous system lymphoma (PCNSL) is a rare tumor accounting for 4% of all brain neoplasms, <10 cases have been described in the literature. Intraventricular meningiomas (IVMs) are rare tumors, accounting for 0.5-5% of all intracranial meningiomas. Malignant IVM (MIVM) is even rarer. 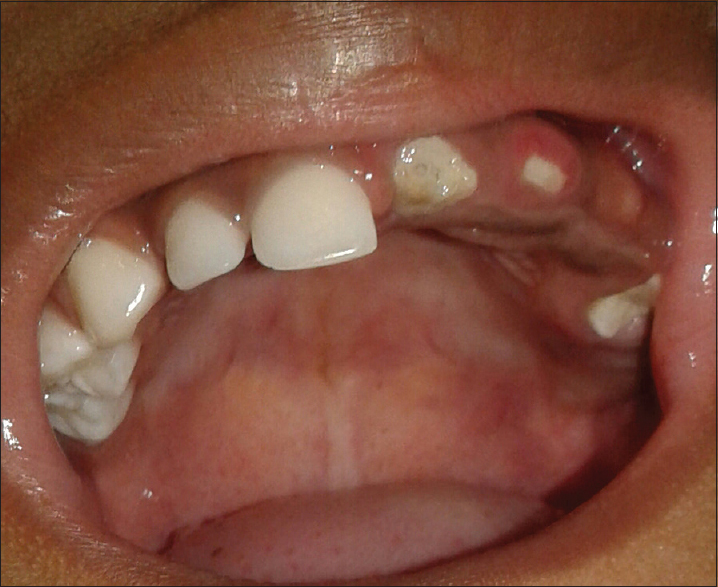 Various factors such as bacterial plaque, aggressive tooth brushing, trauma from oclussion, multiple high frenum, and shallow vestibule that involved in the development and progression of gingival recession, but the multiple high frenum along with shallow vestibule have been major factors of gingival recession, especially in the lower anterior region along with inadequate width of attached gingiva. Multiple techniques have been developed to increase the depth of vestibule and the width of attached gingiva. This case report present, to remove the multiple aberrant frenum and increasing the width of attached gingiva and vestibular depth, in single visit by vestibular deepening procedure. Regional odontodysplasia (RO) is an uncommon nonhereditary developmental anomaly of dental hard tissues derived from ectoderm and mesoderm. The condition is more common in females, may affect primary and permanent dentitions with the maxilla, involves twice as frequently as mandible. The exact etiology of RO is unknown. Diagnosis is usually made by clinical and radiographic findings, sometimes supplemented with histopathologic examination. Clinically, teeth are hypoplastic with surface pits and grooves, and have brownish or yellowish discoloration. On the radiograph, there is reduced radiodensity of enamel and dentin with a lack of contrast between them. 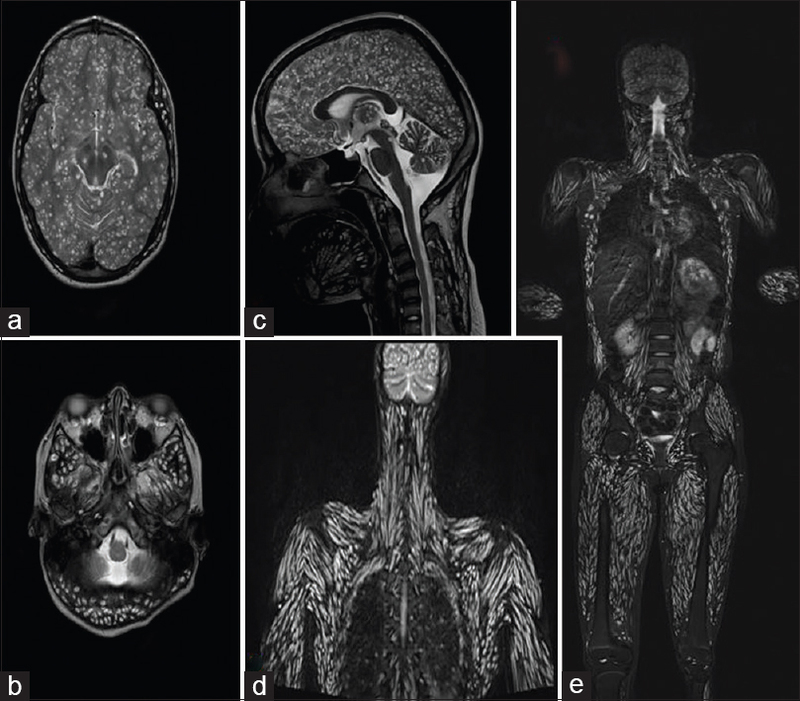 In this article, we described a case of a 3½-year-old girl with RO. The left maxillary quadrant was affected. The patient also showed eruption failure. Treatment of RO is, to a great extent, individualized. As the condition was asymptomatic, the present case was managed conservatively.